Home > Vertex42 Blog > Money Management > Debt Reduction > Debt Payoff – A Good Investment? Paying off high interest rate debt may not always be the best thing to do with your extra money, but if you compare it to investing in stocks or bonds, it has some powerful benefits. If you are satisfied with being told that paying off high interest credit card debt is a good financial goal, then you probably don't need to read this article. However, if you are interested in digging deeper and comparing debt payoff to investing, this article may give you a few new things to think about. Paying off debt is not truly an "investment" because you aren't purchasing an asset to gain a future profit or income. Instead, you are paying off a debt to avoid paying a future expense. That is the concept represented by the above image. Making extra principal payments on your debts reduces the amount of interest paid over time, so that can be thought of as interest saved. The question we are considering is along these lines: "If I have an extra $100 each month, should I use it to pay off debt or invest it?" Are You Ready to Aggressively Pay Off Your Debts? If I found an investment that offered all three of those characteristics, I'd be extremely skeptical because it sounds too good to be true. However, that is basically what you get while you are paying off credit card debt. 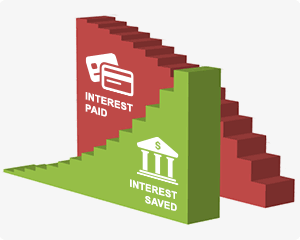 Paying off debt can be compared to investing because when you pay an extra $100 to lower your credit card balance, the amount of interest that you AVOID PAYING over the life of the debt is the same amount of interest that you would EARN if you put the $100 into a savings account with the same interest rate for the same amount of time (not considering taxes for now). 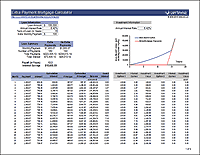 This spreadsheet compares making extra payments on a mortgage to putting money into a savings account. Also, when you pay off debt, you get the advantage of compound interest, just like with a savings account. If you want to compare the math, see my extra payment calculator. For the sake of this article, lets assume that the average credit card interest rate is 14%. If you were looking for a secure investment, a 14% interest rate would be amazing! "Wait" you say ... "you mean a high rate on a credit card is amazing? Are you crazy?" 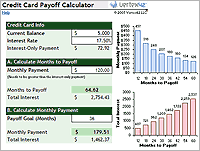 Calculate time to pay off a card with different interest rates. Obviously, a lower rate on a loan or credit card is better if you are the one paying interest on it. But, we are talking about what to do with the extra $100 that you have right now. If you compare a $100 savings contribution that pays you 4% annually to a $100 principal payment on a 14% APR credit card, paying off the credit card is the obvious choice. You save way more money paying off the credit card than you will make by putting your money in a savings account. In investing, the risk vs. return principle says that higher returns generally require taking on higher risk. The risk vs. return trade-off is why your savings account (an extremely low-risk investment) pays less than 1% in interest. A diversified corporate bond portfolio might get a higher return of 5-7% and with lower risk than stocks, but you can still lose money, and we haven't talked about taxes yet. It's nearly impossible to find an investment that will guarantee a 14% annual return without the risk of losing some or all of your investment. In short, the hidden gems in investing are those opportunities that give you a HIGH RETURN with a LOW RISK. If you are currently in debt, paying off high-interest-rate debt may turn out to be your best option. Just make sure you aren't going to fall into the debt trap again in the future. A frequently overlooked gem: If you have the opportunity to take advantage of your employer's 401(k) match, I would do that before paying off debt. If your employer matches your 401(k) contributions, that is an immediate 100% return on your investment (some plans match only 50%, but that's still awesome). That isn't an ongoing 100% annual return. However, an immediate 100% gain is roughly the same as a compounded 15% annual return over 5 years. So, if you are contemplating what to do with your extra $100, but have not yet taken advantage of your 401(k) match, you might consider doing that. If you put $100 into a savings account, you have $100 in cash readily at your disposal if you need it. The availability of your cash is what is meant by "liquidity." If you make an extra $100 payment toward your loan, that cash is gone. You lower your debt, which is the idea, but you lower the amount of cash on hand as well. Liquidity Risk is the reason why a person may not want to put 100% of their extra cash into paying off debt. Some other important goals to consider are (1) maintaining a reasonable spending cushion, (2) setting up a reasonable emergency fund, and (3) obtaining adequate insurance (health, life, fire, auto, etc.). With these goals accomplished, the liquidity risk of paying off debt may become insignificant, allowing you to aggressively attack the debt. Keep in mind that the main purpose of a spending cushion is to avoid unnecessary late fees, bounced check fees, overdraft fees, ability to pay non-monthly bills, etc. Insurance is to protect you from catastrophic financial difficulties. I personally would not aggressively pay off debt until I had a cushion and insurance. One could argue that putting money into an emergency savings account at <1% APR is pointless if you are maintaining balances on 14% APR credit cards. That is why it is often advised to build an emergency fund in stages. For example, you might want to create a 1-month emergency first, and afterwards split your goal between increasing the emergency fund and paying down debt. There are also other ways to prepare for emergencies, such as maintaining a 3-month food supply and having an adequate emergency water supply, that may be more important than emergency money in the bank. After all, money in the bank doesn't do much good if there is no food or water available to purchase. Liquidity of Stocks: If you buy a $100 stock, you can typically sell that stock and have the money transferred to your bank account within a couple days. So, even stock investments may be considered liquid to some extent, but only in a functioning market. Liquidity of Bonds: If you lend a person or business or organization some money, you may not be able to get that money back whenever you want. You may be able to sell your position in a bond mutual fund or bond index fund fairly quickly, which is one of the reason bond funds are popular. However, if everybody tried to sell at the same time, they couldn't. Real Estate: Real estate is NOT liquid. Home equity is NOT liquid. If you need the money within a few days, you aren't going to be able to get it from your home (either by selling or by getting a home equity loan in such a short amount of time). Paying down mortgage debt is definitely a liquidity risk. Paying Off Credit Cards: In general, paying down credit card debt is not a significant liquidity risk because assuming your credit card continues to work, you can charge your card again to get the money out. However, lines of credit can be frozen for various reasons, so depending on a credit card for emergencies is more risky than cash in hand or in a savings account. This is one of the biggest advantages of paying off debt as an alternative to investing. What investments can you think of where you are guaranteed to not lose money on your initial investment? Treasury bills, FDIC insured certificates of deposit, FDIC insured savings accounts - these are backed by the U.S. government. Even though they are pretty secure, they aren't 100% secure if the government collapses. I'm not saying that because I actually think it's a worry ... I'm just saying that because you can always find a scenario in which even the most secure investment may not be 100% secure. For example, one of the risks we face in our modern day is having our bank accounts hacked due to stolen identity or computer viruses. That risk may or may not be significant, but for the purposes of comparing debt payoff to other investments, let's just consider general market conditions. A diversified corporate bond portfolio yielding 6% may offer less risk of losing money than some stocks, but the possibility is still there. If you loan a company $100 (i.e. a corporate bond), and the company defaults on that loan, you lose whatever money they have not paid back yet. You can also lose money if interest rates rise and you sell your lower rate bonds before they mature. Owning a bond mutual fund or index fund does not give you control over the buying and selling of bonds within the fund, so the annual yield of the fund can be negative (especially during a period of rising interest rates). If you purchase a rental property for the cash flow, you risk having the property decrease in value. Insurance may help protect against some catastrophic loss, but if the real estate market tanks you could easily lose 20%-40% or much more (especially since real estate is typically a leveraged investment). If you "invest" $100 to decrease your $10,000 credit card debt to $9,900 then you will not lose money on that $100 investment. The amount you owe won't go back up to $10,000 based on market conditions out of your control. The amount you owe does not fluctuate with market conditions. Interest rates might, but not the amount you owe. So, when you are comparing debt payoff to investing, you can think of your extra debt payment like an investment in which there is zero risk of losing money due to a loss of principal. Is it truly zero risk? Like I mentioned before, I don't think any investment is truly 100% secure. For example, somebody might steal your check and cash it before it gets to the credit card company. Paying down debt is probably similar in security to putting money into an FDIC insured savings account. So, practically zero risk. What about using options to limit losses? If you understand investing well enough to use options to limit your losses, then maybe you don't need to be reading this article. I'm not an expert at options trading, but I think you'd still be hard-pressed to find a hedging strategy that guaranteed both a 14% return AND zero loss. The reason is that hedging against loss usually lowers your possible gain. One thing that you are giving up by paying off debt instead of investing in stocks is the possibility of unlimited gains. A stock might increase by 20% or even 100% in a single year (if you are extremely lucky), so you would be giving up the chance for unlimited gain if you choose to pay off debt instead of invest in stocks. By paying off debt, you know exactly what the return on your investment will be (assuming a fixed-rate debt). If you are paying off a 6.25% student loan, you know that your "investment" will be a return of 6.25%. Even if you are paying off a variable-rate credit card in a period of decreasing interest rates, at least you know that you won't lose money (the return will never be negative), and the return is likely going to be higher than any return you'd get from a reasonably conservative investment. When you have paid off your higher rate credit cards and student loans and car loans and only have your 4.5% mortgage to pay off, then perhaps you'll want to consider both investing AND paying off the mortgage. (1) In a Roth IRA, you invest with after-tax money. You also pay off your credit card with after-tax money. (2) In a Roth IRA, you don't pay taxes on interest earned. Similarly, when you pay off your credit card, you don't pay taxes on interest savings. In my opinion, the simplest approach for comparing tax-adjusted rates of return is to compare the effective after-tax rates, which are calculated as rate*(1-taxrate). For example, paying off a 10% APR credit card is actually better from a tax perspective than investing in a taxable savings account that earns 10% APR (if there was such a thing). But, how much better? If the savings interest is taxed at 20%, then the effective after-tax rate of the 10% savings account would be 10%*(1-20%) = 8%. You only need to make adjustments to investment rates if they are taxable. This means that when you think about paying off a 10% credit card, you don't need to do any adjustment to the rate (because you don't pay tax on interest savings). Likewise, if you are making investments in a tax-efficient account (like an IRA), you don't need to make adjustments to dividend, bond, or capital gain rates. Municipal Bonds: Because you don't pay taxes on municipal bonds (assuming the interest earned is exempt from both state and federal tax), the rate of return can be compared directly to the debt payoff rate - no adjustments needed. Municipal bonds are currently going for maybe 3.5% for AA bonds that have insurance. Paying off a 10%-14% APR credit card looks a lot better than that. Mortgage Interest Deduction: A primary home mortgage is one of the only common debts where interest payments may be tax-deductible (student loan interest is another if your MAGI is low enough). If you are able to claim the mortgage interest deduction, and your effective tax rate is 20%, then the effective after-tax rate of a 4.5% mortgage is 4%*(1-20%) = 3.2%. So, when comparing paying off this mortgage to paying off a 10% APR credit card, you compare the 10% and the 3.2%. Another argument against paying off debt is the idea that if inflation skyrockets, people with low fixed-rate debts will benefit (see this article). That is because the amount you owe AND your interest payments will stay the same while other expenses increase. If your income also rises with inflation, then your ability to pay off the loan may get easier. When it comes to inflation, paying off fixed-rate debts may be compared to putting money into a fixed-rate savings account (ignoring taxes for now). You won't lose your $100 investment, but the relative purchasing power of the money decreases. Credit card debt is not usually fixed-rate debt, though. The rates on adjustable-rate loans and credit cards will increase with inflation. This will negate the benefit a debtor might have gained from inflation. If this article has helped convince you that paying off high interest debt is a good investment, then consider the following checklist. This doesn't list everything you might possibly want to consider before aggressively paying down debt, but it's pretty good. ☐ I am able to resist impulse purchases, and avoid trying to "keep up with the Joneses"
Keep in mind that you can work on more than one financial goal at a time. A good financial advisor should be able to help you identify and prioritize goals. But, ultimately it's your own responsibility to learn what you need to learn and decide what is best for your particular situation. 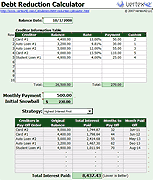 When you are ready to aggressively pay off your debts, take a look at my free Debt Reduction spreadsheet! Use this spreadsheet to list all your debts and apply the snowball or rollover technique to see how quickly you can become debt free! What I especially like about debt payoff is the simplicity. You don't have to be an investing genius to find a secure investment offering a great return. If you have high interest debt you need to pay off, the answer may be right in front of you. I wrote my first draft of this article in March of 2009, and have been working on it off and on for the past 8 years. 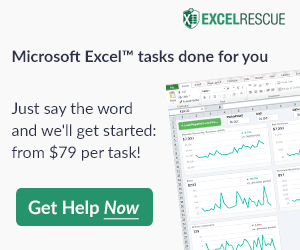 Even though it's a bit off topic from my Excel-specific posts, I hope you get something useful from it. Please comment and share. Previous Post: Volatile Functions – What’s the Big Deal?